In 1819, the Secretary of the U.S. Treasury, who was in charge of the young nation’s lighthouses, faced a difficult decision. Congress had appropriated funds for aiding navigation on the Chesapeake Bay, but the amount was enough to illuminate only one of two vital areas: “Windmill Point, at the south of the Rappahannock River, or a light vessel or boat on Wolf Trap Shoals…” After weighing the merits of the two options, the Secretary chose the Wolf Trap site as the more pressing need. Perhaps the Secretary had in mind the misfortune of the Wolfe, a 350-ton vessel of the Royal British Navy that was enlisted to combat piracy and smuggling, and to enforce the Navigation Acts so detested by the colonies. In 1691, the Wolfe ran aground on the shoal to which she would reluctantly bestow her name. The ship’s captain immediately summoned help, and watermen of the Virginia colony made haste to unload the heavy guns, ammunition, and stores weighing down the ship. 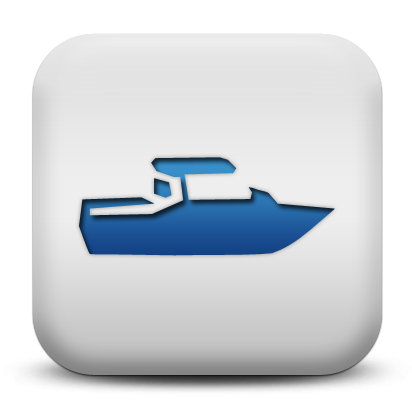 After the seawater that had leaked through the hull was pumped out, the vessel floated free and was towed to safety. The captain was grateful for the aid, but refused to compensate the watermen for their efforts. The colonial governor held the captain liable and ordered the garnishment of his wages. Ultimately, the ship’s owners settled the captain’s debts, but the affair so angered the watermen that they thereafter referred to the shoal as Wolf Trap. The troublesome Wolf Trap Shoal received a brand new 180-ton lightship in 1821. The vessel carried two fixed lights, at elevations of thirty and thirty-eight feet, which were visible for ten miles. To further aid mariners, a fog bell was also mounted on the vessel, which was painted lead-gray and had “Wolf Trap” stenciled in black on its sides. 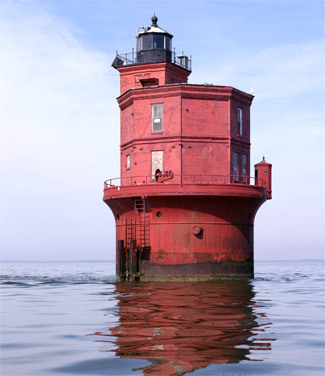 After taking responsibility for lighthouses from the Treasury Department in 1852, the Lighthouse Board took measures to refurbish many of the deteriorating lightships in the Chesapeake. In August 1854, the Wolf Trap was towed to Alexandria, Virginia, where it was repaired and outfitted with new lanterns, but the repairs were for naught as insurgents destroyed the vessel in 1861 after the outbreak of the Civil War. Three years later, another lightship was placed on the station when the Union had the region firmly under its control. Following the war, however, the Board was intent on replacing costly lightships with economical screwpile lighthouses. These innovative lighthouses required less maintenance and fewer personnel than lightships, but, as will be seen, they weren’t a perfect solution. The hexagonal dwelling and supporting ironwork that had been assembled at the Lazaretto Depot near Baltimore were transported to Wolf Trap Shoal in the spring of 1870. Multiple, cast-iron screws were secured in the seabed, and the dwelling was mounted on top of these spindly legs. Construction of the new light mostly went off without a hitch, except when a storm blew away the workmen’s platform and delayed the first lighting until October 1, 1870. 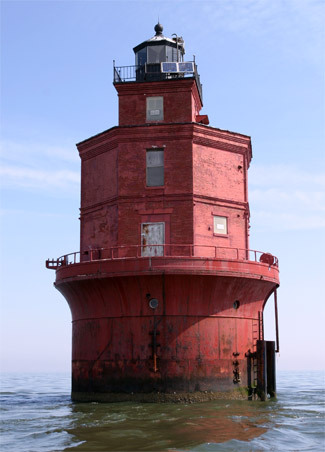 The lighthouse stood in sixteen feet of water, and the focal plane of the fourth-order Fresnel lens in the lantern room was thirty-eight feet. The lens produced a fixed white light, punctuated by a brilliant flash every thirty seconds, which could be seen for eleven-and-a-half nautical miles. The Lighthouse Board confidently stated: “There is no doubt that the structure as it is built will have all the stability requisite to resist the severest storms and the heaviest ice,” but that wouldn’t turn out to be the case. On January 22, 1893, heavy ice floes severed the lighthouse from its foundation. A few days later, the lighthouse was found afloat several miles to the south near Thimble Shoals, with only its roof and lantern still peeking out above the water. 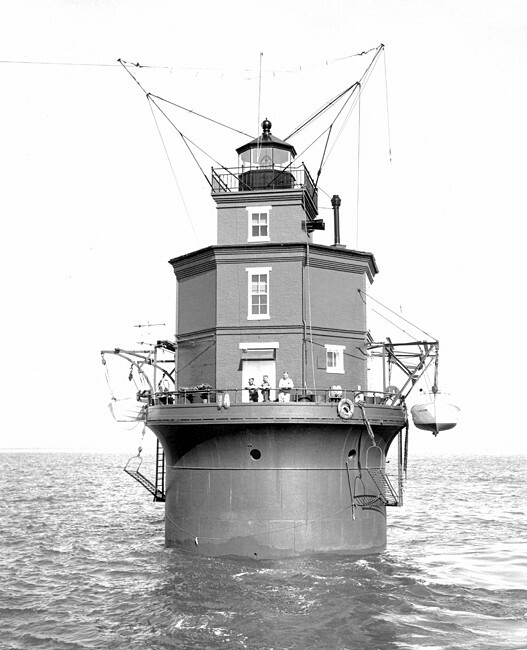 The lens and lantern room were salvaged from the lighthouse, and the navigational hazard was then towed to Portsmouth. Assistant Keeper John William Thomas had observed the ice building up day after day around the lighthouse in January 1893 with a dreadful foreboding. He reportedly prayed “long and fervently” for help and not long thereafter saw in the distance a column of smoke from a steamer battling the ice. As the steamer drew near, Keeper Thomas abandoned the lighthouse to its fate and set out on the ice waving his hat to attract those aboard the steamer. Thomas was able to reach the steamer and have it transport him up the bay from where he crossed the ice to the shore, but not before breaking through the ice and nearly drowning. 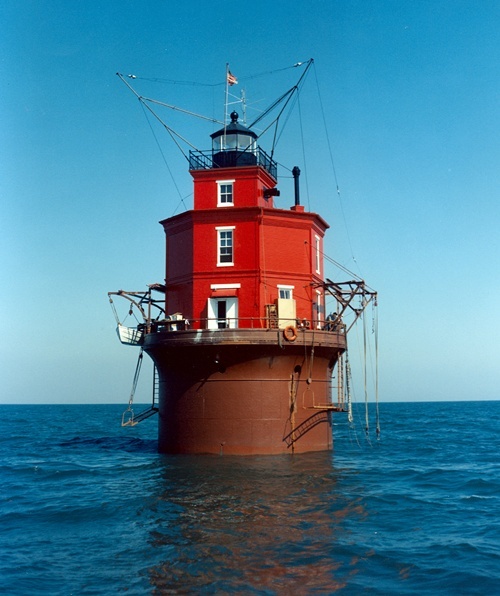 A lighted buoy was placed on Wolf Trap Shoal in March, and then in June the lighthouse tender Holly was equipped with a light and dispatched to the shoal for emergency duty, until a lightship could be reassigned to the station. Meanwhile, the Lighthouse Board requested proposals for an iron caisson lighthouse which, by reason of its weight, would be able to resist the destructive impact and the great pressure resulting from moving ice fields. Congress appropriated $70,000 on March 3, 1893 for the new lighthouse that would consist of a brick keeper’s dwelling resting on a pier whose shell was composed of 210 cast-iron plates bolted together. The pier had a diameter of thirty feet, stood forty-two feet high, and was bolted to the roof of a wooden air-tight caisson equipped with a five-inch steel cutting edge. During construction of the lighthouse, the caisson was pressurized, allowing men to excavate the seabed beneath the caisson and pier so they could sink to a proper depth. The caisson and pier were then filled with concrete to a level of thirty feet above the roof of the caisson. On January 13, 1894, the caisson, attached to the first two courses of the iron pier, left Baltimore under tow and was sunk on site six days later. Embedded in the top of the concrete are two water cisterns holding 4,500 gallons, and above these in the fluted portion of the pier is a cellar with rooms for a compressor and for the storage of oil, coal, and provisions. Walls and steel beams divide these rooms, making them “reasonably fireproof.” The top of the pier protrudes twelve feet above the water and supports the octagonal, brick keepers’ dwelling, which has a kitchen and sitting room on the first level, three bedrooms on the second, and a watch room in the square tower just beneath the lantern room. The water closet was an iron structure, resembling a guard shack, cantilevered over the edge of the pier. A fourth-order lens was placed in the lantern room and exhibited its light for the first time on September 20, 1894. To aid mariners during periods of low visibility, the lighthouse was equipped with a second-class Daboll trumpet, which sounded a three-second blast every ten seconds. 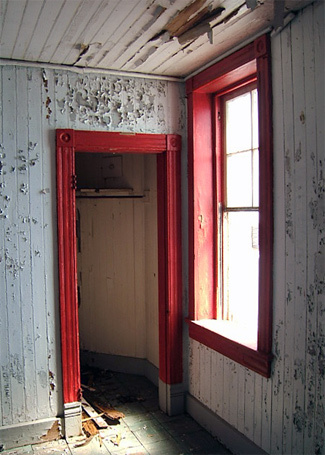 In the late 1920s, the redbrick dwelling was given a red coat of paint to protect the bricks from the corrosive saltwater spray. As Wolf Trap Lighthouse was equipped with a radio calibration station, it was one of the very last manned light stations on the Chesapeake, not being automated until 1971. Under the provisions of the National Historic Lighthouse Preservation Act, Wolf Trap Lighthouse was offered to qualified organizations and non-profit groups in 2004. 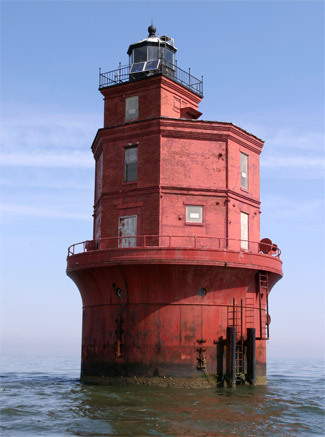 When no applications were received, the lighthouse was auctioned online by the General Services Administration in October of 2005. 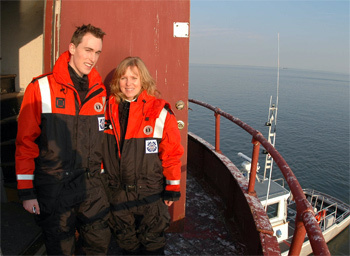 Nick Korstad submitted the winning bid of $75,000, with intentions of opening the lighthouse as a bed and breakfast, but after nine months of unsuccessfully searching for a lender willing to make a loan for a lighthouse, Korstad put the lighthouse up for auction on eBay with a starting bid of $119,000. Just hours before the auction was set to expire, a bid was made, but the potential buyer wanted to send out engineers to inspect the lighthouse before making a down payment, and the deal fell through. 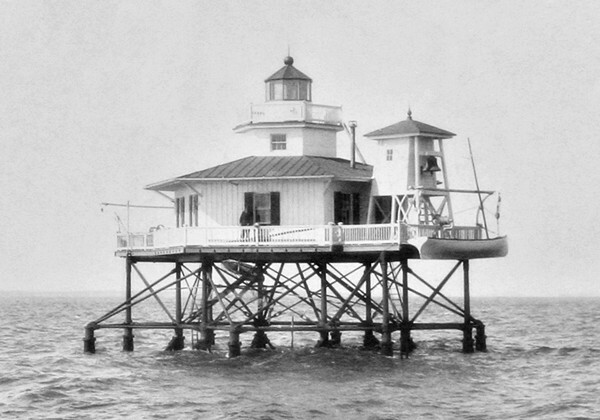 Roughly six months after the auction, James H. Southard, Jr. of Charleston, South Carolina contacted Korstad and purchased the lighthouse from him for $115,000. 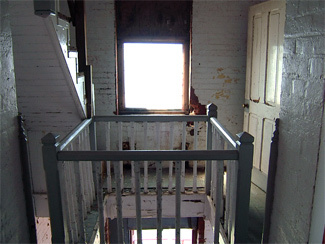 A new roof was installed at the lighthouse in 2007, and then attention was turned to restoring the interior of the lighthouse. Though it is now privately owned, Wolf Trap Lighthouse will remain a familiar daymark and a Coast-Guard-maintained aid to navigation, faithfully demarcating the location of treacherous Wolf Trap Shoal. Wolf Trap Lighthouse was back on the market in 2012, with an asking price of $288,000, which included a waterfront lot on Horn Harbor. Head: Samuel Trader (1870 – 1874), Willis C. Wilson (1874 – 1875), John L. Burroughs (1875 – 1887), Oliver R. Hudgins (1887 – 1888), Joseph R. Diggs (1888 – 1893), Charles B. Prosperi (1894), Peter W. Jarvis (1894 – 1907), James G. Williams (1907 – 1908), James B. Hurst (1908 – at least 1919), John T. Saunders (1921 – at least 1930), Nelson H. Lewis (at least 1939 – at least 1940), Floyd E. Crewe (at least 1965). First Assistant: Thomas F. Morgan (1870 – 1872), J.B. Owens (1872 – 1873), Dixon Shinault (1873), Willis C. Wilson (1873 – 1874), C.W. Adams (1874 – 1875), Jacob Luskey (1875 – 1876), James K. Hudgins (1876 – 1878), A.F. Hudgins (1878 – 1879), Thomas J. Banks (1879 – 1881), Sidney Lane (1881), E.M. Sandy (1881), Wesley F. Ripley (1881), A.F. Hudgins (1881 – 1882), John W. Morgan (1882 – 1886), Oliver R. Hudgins (1886 – 1887), Joseph R. Diggs (1887 – 1888), Charles F. Hudgins (1888 – 1890), John W. Thomas (1890 – 1893), George E. Hunt (1894 – 1895), James B. Williams (1895 – 1897), Richard W. Marchant (1897 – 1901), Walter M. Shawn (1901 – 1902), Walter S. Hudgins (1902 – 1906), Alexander P. Hurst (1906 – 1907), Edward Farrow (1907 – 1908), John F. Hudgins (1908 – 1909), Virgil J. Montague (1910 – at least 1919), Benjamin D. Preston (at least 1921 – 1925), George C. Hunley (1925 – ), Henry L. Matthews (at least 1926 – at least 1930), Carroll F. Thomas (at least 1939 – 1941), Elmer M. Goodwin (1941 – 1943). Second Assistant: Amos Ranier (1870), Emma J. Trader (1870 – 1871), Josiah Bailey (1871 – 1872), Charles Cummings (1872), Francis Beasley (1872 – 1873), C.W. Adams (1873 – 1874), Dixon Shinault (1874 – 1875), Robert G. Griffin (1875), James K. Hudgins (1875 – 1876), James Copeland (1876), A.F. Hudgins (1876 – 1878), Sidney Lane (1878 – 1881), John W. Morgan (1881 – 1882), L.D. 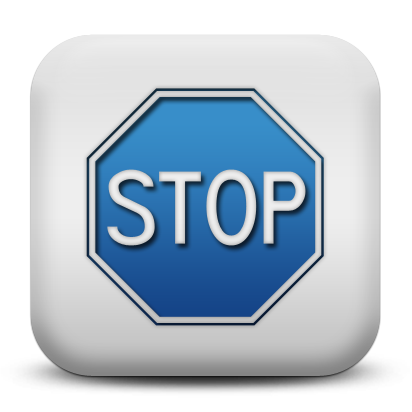 Marchant (1882 – 1883), James W. Hudgins (1883), Charles W. Adams (1884), Washington Repass (1884), Joseph B. Diggs (1884 – 1885), James H. Brooks (1885), Oliver R. Hudgins (1885 – 1886), Joseph R. Diggs (1886 – 1887), Charles F. Hudgins (1887 – 1888), John W. Thomas (1888 – 1890), Charles W. Davis (1894 – 1895), Walter M. Shawn (1895 – 1901), T.M. Foster (1901), Edward F. Stowe (1901), John H. Grain (1901 – 1903), Alexander P. Hurst (1903 – 1906), Albert C. Myers (1906), Horace C. Groom (1906 – 1910), Rufus T. Hunley (1910 – 1916), William J. Diggs ( – 1917), John E. Morgan (at least 1918), Albert E. Moore (1919), Henry L. Matthews (1921 – ), Enos L. Brooks (at least 1930), C.F. Thomas, Nelson S. Atherton (at least 1939 – at least 1940). “John Thomas’ Prayer In a Lighthouse,” Cortland Evening Standard, March 3, 1893. “Wolf Trap Facelift,” The Keeper’s Log, Fall 1991. “Assistance Rendered by Keepers,” Lighthouse Service Bulletin, October 1919. Located on the western side of the Chesapeake Bay just over three miles offshore and at a point roughly midway between the Piankatank River and Mobjack Bay. For a larger map of Wolf Trap Lighthouse, click the lighthouse in the above map. This light is best viewed from the water. Trips to the lighthouse can be arranged by contacting The Inn at Tabbs Creek. The lighthouse is privately owned. Tower closed.